Sometimes you can't see the wood for the trees – this can certainly be true when trying to pick where to go on your holiday in Sicily. are perfect for spending the winter months. The following three holiday destinations stand out from the crowd because of the nearby capital Palermo. All of them have a Trenitalia station that connects them directly to central Palermo. Being close to Sicily's biggest city has extra advantages if you intend to spend the winter months in the Mediterranean sun. During this period you have almost all the city’s sightseeing hotspots to yourself. Spending the winter in Sicily also offers great opportunities to learn Italian, the world's most romantic language! You will find certified language schools in all of the following holiday destinations. 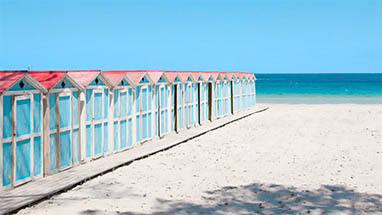 Bagheria (marker 1) appeals to holiday-makers in Sicily because of its villas and cottages right on the beach. They have breathtaking views of the entire Gulf of Palermo and many have small, private beaches as well. Cefalù (marker 2) offers the rare combination of a wonderful beach and a medieval city centre. Cefalu is also considered the capital of the Madonie, one of the largest nature reserves in the Mediterranean. Santa Flavia (marker 3) is perfect for a combined beach and sightseeing holiday - without needing a rental car. From the Trenitalia railway station in Santa Flavia you can reach Palermo central station in just 20 minutes.